As every off-season, Simon is participating in many regional charity events in Québec, Canada. For the 12th time, Simon held a charity golf tournament which took place last week in Charlesbourg. All the proceeds which were $83.000 this year, went to the Leucan organization. Not even a month later there will be another event – the Pro-Am Gagné-Bergeron. Patrice Bergeron and Gagné will participate in the Pro-Am for their fifth time. The Pro-Am Gagné-Bergeron for kids of Québec brings, once again, a great number of participants. 1400 tickets have been already sold as of Tuesday for the event, which will take place August 8th. 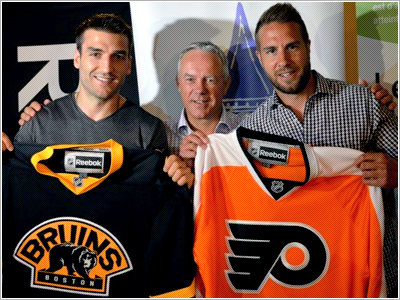 Hockey players Patrice Bergeron and Simon Gagné are organizing this event for a fifth year. The game will take place August 8th in L’Ancienne-Lorette, in the outskirts of Quebec City. Participants have to shell out 3000$ to have a spot on one of the teams and have the chance to play with players from the National Hockey League. Sixteen players have already confirmed – David Desharnais, Alex Tanguay, Antoine Vermette, Maxime Talbot or Marc-Édouard Vlasic, to name a few. This year, the Pro-Am will be preceeded by a tail gate in the the sports complex’s parking lot. At 4 PM, the players will meet the fans and will sign autographs. The goal of this event is to raise more than 100 000$ for Pignon Bleu and Leucan. source: Radio Canada; Big thank you to my friend Myriam for the translation from French!